This Christmas we had a music theme throughout the house. 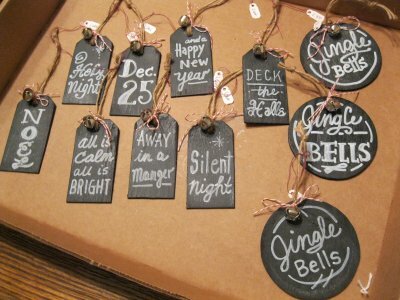 I made these mini chalkboards with words from Christmas Carols on the front and left the back to personalize. I love to make ornaments that can be shared with friends. These can be taken home by guests after a party. Cut wood pieces, drill hole at top for hanging- or use the precut pieces. Paint both sides with chalkboard paint. Rub front with chalk to ''season'' the board and wipe off with soft cloth. Loop jute through hole and tie knot. 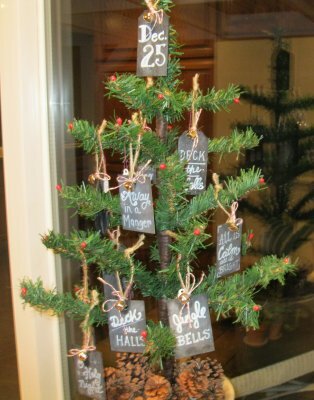 Tie bell to ornament with bakers twine. Personalize your ornaments with names, love notes, the possibilities are endless.